One thing is for sure: the Apple Mac platform has made a significant impact on organizations. A decade and a half ago, virtually all platforms within an organization were built on the Windows operating system. However, a great deal has changed in the past fifteen years. Apple’s resurgence has dramatically altered the look of IT networks. Today, it is common for organizations to be heterogeneous, with Windows, Mac, and Linux devices populating their environments. Some organizations are even all Mac. For many of these IT organizations, Apple Open Directory has served as their core directory service. Not surprisingly, as they move to the cloud, these organizations are seeking an Apple Open Directory alternative. Apple Open Directory is part of the Apple OS X Server platform. Over the past few years, there has been less focus on Apple’s server platform than their other products. Apple has been gaining significant market share with their laptops, desktops, and mobile devices. IT organizations that start with Apple Open Directory then experience significant growth tend to add a variety of different platforms, including Windows and Linux machines. Some of those Linux machines may even live at Infrastructure-as-a-Service providers such as AWS or Google Compute Engine. While web-based applications are now a normal part of any organization, legacy applications that leverage LDAP are still popular. WiFi networks that are backed by the directory service are desirable as well. As an IT organization begins to deal with a wide variety of platforms, protocols, and locations, they often will seek out an independent directory service to help them connect their users to all of their IT resources. Directory-as-a-Service® platforms are the modern equivalent of legacy on-premises directory services. These cloud-based alternatives are making significant inroads. What do DaaS platforms do? They connect users to a wide variety of IT resources. They treat Macs, Windows, and Linux devices all as first-class citizens. LDAP-based applications and web-based SAML apps are also treated similarly, with users being able to connect to both types. And, the WiFi network can leverage RADIUS-as-a-Service infrastructure to add significant security to the wireless network. SaaS-based directory services are focused on cloud-forward IT organizations that are leveraging a variety of platforms. In particular, Macs are managed with respect to both user access and devices. Similar to Microsoft Active Directory’s GPO functionality for Windows platforms, DaaS platforms have command and task execution capabilities. There’s one big difference, though. DaaS capabilities work well with Macs, Linux, and Windows. Are you struggling with the next step of your identity management journey? 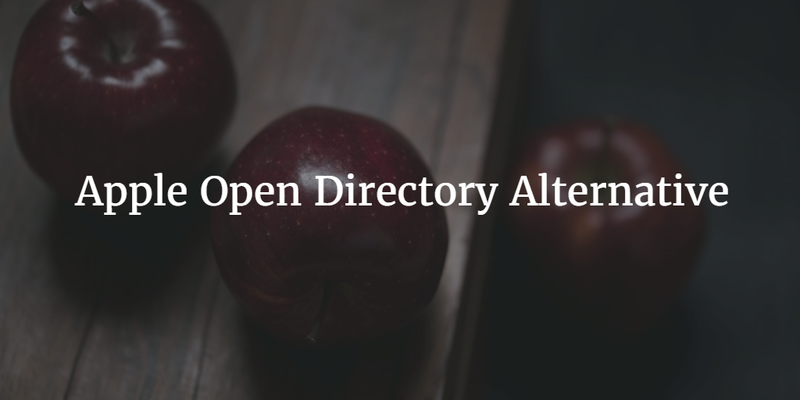 If you are currently leveraging Apple Open Directory but need an alternative, drop us a note. We’d be happy to walk you through how JumpCloud’s Directory-as-a-Service may be an option for you. Or, feel free to check out JumpCloud’s Mac support by signing-up for a free account. Your first 10 users are free forever.